There's a great article posted today on USAToday.com that shows just how flawed voting has become in selecting the NBA All-Star team ("Curious picks, and a call to alter All-Star voting"). As it has been for years, fans vote in the starters for the East and West teams. But online voting and, for the first time this year, text-message voting has made it easier than ever. But the problem is that too many fans are voting for players who don't deserve to be starters. Case in point, as the article points out, Allen Iverson and Tracy McGrady are currently among the leading vote getters, and if their spots hold up when voting ends tomorrow night, they'll both be starters. Iverson didn't play about half this season and was semi-retired. McGrady has only played six games this season. Both of those guys are being voted in by their huge fan bases. And not only does their play this season not merit them starting in the All-Star game, they shouldn't even be on the team. NBA coaches vote in the reserves, which helps ensure deserving and sometimes overlooked players get in. But regardless, Iverson and McGrady are going to bump two people off because of the roster spots they'll hold. Iverson is in the Eastern Conference and McGrady is in the Western. 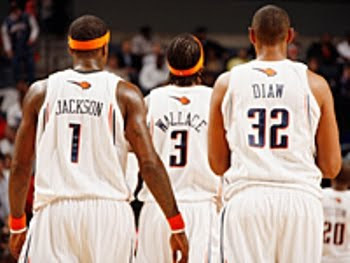 I'll tell you two players who need to be selected by the coaches for the East team or I'm going to cry foul: Charlotte Bobcats Gerald Wallace and Stephen Jackson. In their six-year history, the Bobcats have never had a current player make the NBA All-Star team. But with Wallace averaging 18 points and 11 rebounds per game this season, and Jackson putting up 20 points, 5 rebounds, and 4 assists, it's hard to argue against these two being chosen as All-Stars. Click here to vote for Wallace and Jackson on the NBA All-Star ballot, which you can do until 11:59 p.m. Monday night (Jackson appears on the Western Conference ballot because it was created before he was traded to Charlotte from Golden State).